Here you can find the guide to install the latest AMMR files. The files will be located locally, in the Documents folder of each user on your computer. If there are multiple users using your computer, each of them will have to follow this guide. This installs the repository into your Documents folder (e.g. ~/Documents/7.2.x/AMMR.v2.2.0-Demo). You may keep this files safe on your computer by copying them to another location. 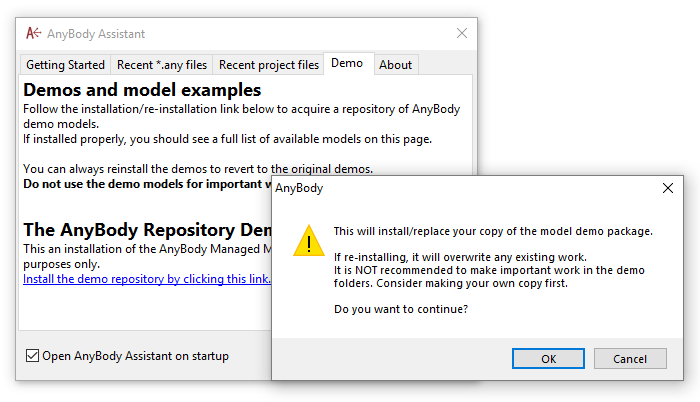 There you can initialise a git repository in which you can version you models, keep a backup or share them easily with the community. As written before, AnyBody Modelling System comes with a version of AMMR (not necessarily the latest) which you can find in the installation folder of the software. Do not use these files for your actual work unless you copy them somewhere else. There is a risk to lose your changes in case AnyBody is reinstalled or updated. You can use these files safely by copying them in your work folder.